Judith Butler has, on many different occasions, pointed out that she is taking on the legacy of Hannah Arendt. And by this she means Arendt’s legacy vis-à-vis her work on the political. One of the terms Butler uses in her political vocabulary – which also pops up in her work on sexuality – is “normalization.” When used by Butler, this term has the most negative connotations imaginable. If anything, she wants to keep this or that regime, political movement, or discourse in check by making sure that it is not normalized. Hetero-normativity or any normativity for that matter is problematic for her. 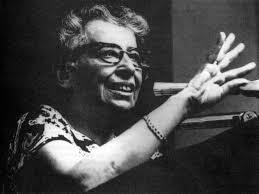 But if one were to critically look into one of the most important essays of her predecessor – namely “The Jew as Pariah” – he or she would notice that at the end of the essay Arendt imagines a movement away from the schlemiel/pariah (the outsider) to the insider. She points out that Kafka – and she herself – dreamt of living a “normal” life (and that his novels illustrate this fact). This “normal” life isn’t the life of the “parvenu” which, as she points out in her essay, is in tension with the pariah. Rather, by normality Arendt believed Jews should – at some point – stop being “exceptional” pariahs. But what does this mean? Does it imply that Jews will just be like everyone else? Is the goal normality? And what would Butler say about that? Since Arendt doesn’t properly explain what she means by normality, we can only surmise that she associated the schlemiel (as Zionists did) with Diaspora. (After all, she did write articles for a Zionist Newspaper in Germany for many years and it is plausible to suppose that her writing and thinking was deeply affected by her journalistic engagement.) A writer who provides a good contemporary illustration – albeit in fiction – of the transition from the “exceptional” schlemiel to the “normal” man is Gary Shteyngart. As I pointed out at the beginning of this blog series, Shteyngart ends his debut novel The Russian Debutante’s Notebook with what I call a “dad ending.” It, like Arendt’s ending, is dad/bad because it effaces the “exceptional” aspect of Jewishness (embodied in the schlemiel) in the name of being an American; that is, normal. To be sure, Arendt never specifies where one will become normal (she doesn’t mention Israel); however, she hints at America when she says that Charlie Chaplin’s “Great Dictator” (for her, the last schlemiel in the “hidden tradition” of the pariah/schlemiel) is replaced by Superman. (And that replacement happens in America, not in Israel and not in Europe.) That said, I’d like to look at how Shteyngart’s “dad ending”(which happens in America), reflect on whether it is the best ending, and show how it addresses a problem that Arendt left hanging in her essay. As I pointed out in yesterday’s blog entry, Vladmir starts thinking about living a “normal” life by way of an American woman he meets in Prava named Morgan. She uses the most simple terms to describe the world, which for her is divided into “good” and “bad” people. She tells Vladmir is good, however, at first, he doesn’t believe it. Like Arendt, Vladmir wants to live in the world. And Morgan is the way into it: not his family, not his new work as a criminal, and not his previous life as a schlemiel. But his decision to leave is not so clear; in a way, it has to be made for him. He retorts by pointing out that she has been seeing a political activist named Tomas. To be sure, Morgan has a soft spot for the political and, with Tomas, was planning to blow up a political area in Prava called “The Foot.” But as the novel comes to an end, she just wants to get it done and leave the country. Paralleling this, Vladmir also wants to leave. They both want to return to America. The straw that breaks Vladmir’s back and spurs him to leave in a flurry is associated with the figure of Skinheads. Before taking Morgan for dinner with The Groundhog, Vladmir, on an evening out with his American friends, is accosted by a group of Skinheads who take him for a “Turk.” They beat the hell out of him; however, there is little reflection on what this means in terms of the country he has chosen to live in. The Skinheads return after Vladmir takes Morgan out to Road 66. But this time they are sent by “The Groundhog.” They are sent because, apparently, Rybakov didn’t get his American citizenship and Vladmir is found to be a traitor. After being badly beaten, Vladmir goes off to the Hospital. Meanwhile, the final plan to blow up “the foot” and to get Vladmir out of the country is underway. The end of the novel is full of action and suspense. And, like the section of the novel on Jordi and the chase (which was the event that made Vladmir more “masculine” and prompted him to leave America for Europe and a life of crime), this section is intense. This flight, like that one, is transformational. These last words also indicate that Vladmir’s life has been a life of lies. In contrast, the Epilogue suggests that now, in America, he will live an honest and normal life. We meet him on his birthday. But in contrast to the first birthday – which the novel begins with – he is not a schlemiel. In other words, he is not exceptional. He is normal. He is married to Morgan, they both have normal jobs (he works for her father), and they have a child on the way. I call this a “dad ending” because that is what it is. He ends the novel as a dad (rather than a schlemiel or a “bad” man); but it is – ultimately – a bad, Hollywood ending. Given what was put forth in the first ¾ of the novel; it is odd. The rush to normality should evoke questions in the reader regarding Vladmir’s identity. Too much of what he was seems to have been left in the past; his birthday epilogue suggests that he has exchanged the exceptional for the normal; the schlemiel for the everyman. Over the last decade or so, this formula has been used by Woody Allen, Judd Apatow, and a few other screenwriters and filmmakers to illustrate a shift away from the schlemiel. Its odd that Allen started doing this – with his film Anything Else (2003)– around the same time Shteyngart published his debut novel 2002. Like Arendt, Allen, Shteyngart, and Apatow are all interested in leaving the schlemiel behind – or at least putting him through a process in which he/she goes from being a schlemiel to a normal individual. Do they illustrate what Arendt claimed Kafka’s novels all point to: a desire for a normal life? And is this life the “world” that she wanted to be in tune with? I wonder about Arendt’s turn to the normal, just as I wonder about Shtyengart’s (Apatow and Allen’s turn). They seem to be taking a German-Jewish reading of the schlemiel to heart. The Eastern European reading of the schlemiel, in contrast, looks to keep the exceptional nature of the schlemiel at the forefront. The reason for this has to do with the fact that they didn’t think a happy ending – with the schlemiel transforming – was the point of this character. In truth, it has to do with challenging the “status quo” not becoming it. Although Arendt may have envisioned a world where no one was exceptional and all lived a normal life (and that world may have been in America), the fact remains that she saw normality as the goal. She had no vision of a perpetual revolt that would be spurred by way of the schlemiel. For her, it had a historical purpose. But, apparently, when Jews were given the opportunity to participate in history and politics, its role ended. Arendt is unclear on this note. However, she does suggest it in her reading of the schlemiel since it is displaced, in her view, by Superman and has less weight in Kafka’s imagination than the “normal” life. The question, in all of this, is what is so “exceptional” about the schlemiel. Arendt uses this term and so does Shteyngart. And they both define the schlemiel in terms of what they think is exceptional. And the long and short of it is that what they find exceptional is exile. They have no need for it, but, in truth, when will it ever end? Can American Jews end this chapter of history and simply pat themselves on the back? Perhaps it would be better if there were no epilogue…. The answers to all of these questions, hinge on how we interpret the exceptional nature of the schlemiel: what it is and whether or not it is necessary or desired…today.